A neighborhood in Cranbury, New Jersey has been sentenced to a holiday season in the pit of misery. An over-the-top Christmas light display in the town of about 4,000 has paid homage to the ubiquitous Bud Light commercial where a medieval court cheers "dilly dilly" to the beer and sentences craft beer lovers to the pit of misery. 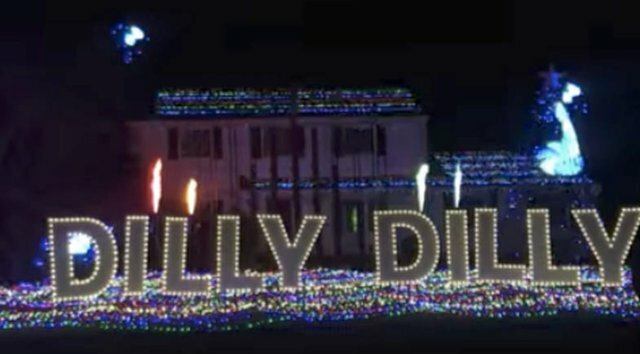 One house in Cranbury has constructed a 45-minute "Dilly Dilly Holiday Light Extravaganza" that includes thousands of Christmas lights, occasional bursts of flames, and a huge "dilly dilly" sign at the center. The whole thing is even set to the music from the original "banquet" commercial. Even though people still seem to be confused about what "dilly dilly" means, the commercial has clawed its way out of the commercials and into your life. Craft breweries have poked fun at it (and received cease and desist notices from a town crier), it's been heard in audibles during NFL games, it's on ugly Christmas sweaters, and now there's a massive Christmas light display. The flames are a nice touch. This display might not have the themed weirdness of that Darth Vader Christmas light display in San Antonio, but it gets points for being something you probably won't find anywhere else in the world.